TOKYO, Feb. 6, 2018 /PRNewswire/ -- QUOINE, a leading global cryptocurrency fintech company, announced today that they signed an MOU with Quantstamp Inc. intended to enhance the smart contract security of select projects conducting their ICO on QUOINE's ICO listing and crypto-to-crypto trading and exchange platform, QRYPTOS. Quantstamp Inc. is developing a security protocol that audits smart contracts using formal verification techniques to find vulnerabilities before they are published to the blockchain. Quantstamp is designing its audits to be secured and verified by a distributed network of nodes, much like an Ethereum node secures and validates an Ethereum transaction. This model is intended to make the Quantstamp protocol a scalable and cost-effective solution to the smart contract crisis. Currently, over 256 million USD in Ether were either lost or stolen due to faulty smart contracts. "Being the first global cryptocurrency fintech company to receive a license from the Japan Financial Services Agency, it is our mission to foster security and compliance to safeguard our customers' assets on our trading platforms," says QUOINE CEO and Co-founder Mike Kayamori. 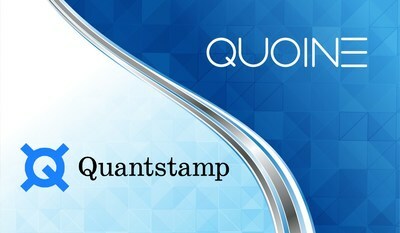 "By further developing our partnership with Quantstamp, we expect to further enhance ICO security in the crypto ecosystem and extend Quantstamp's Proof-of-Caring spirit to the QUOINE community." "Quantstamp's mission is to be the security infrastructure upgrade for blockchain technology," says Quantstamp CEO Richard Ma. "I believe we are taking a powerful step towards our common vision."